This time of year, gardeners are doing as many spring gardening to-do’s indoors as they are outdoors – perhaps even more. Because winter weather and extreme cold temps continue to grip so much of the United States – Indiana included – we’re fine with that! If you are working outside, however, make sure you’re bundled up tight, taking care to protect your back and joints when lifting heavy snow and staying hydrated. Survey the landscape and make sure ice melt and salt is not covering tender plants. Brush it off with a broom or hand brush. Repair or build a trellis for roses and other vining plants or clean up existing raised flower beds of debris, if you haven’t already taken care of this last fall. Plant or transplant dormant deciduous plants such as stone fruit trees, hardy perennials, berry shrubs and shade trees. To help with digging holes in still-frozen ground, try renting an earth drill, which uses an auger and machine power to break through hard-to-move soil. These tools also help enormously if you’re building a fence. If you see spring-flowering bulbs start to break ground, surround them with a little mulch and fertilize. To start planning this year’s garden, it may be helpful to become familiar with the U.S. Department of Agriculture’s Plant Hardiness Zone Map. The interactive map was updated about three years ago and puts Central Indiana in Zone 6a (-10 to -5 degrees F). 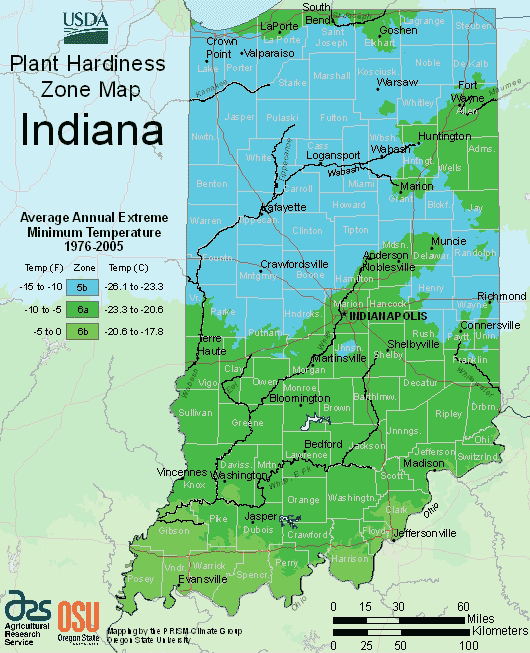 Most of Northern Indiana is in Zone 5b (-15 to -10 degrees F), and most of Southern Indiana is in Zone 6b (0 to -5 degrees F). Plug your ZIP code or GPS coordinates into the interactive map to get detailed information about the average weather where you garden. The U.S. government, Oregon State University, meteorologists, horticulturists and experts in agriculture analyzed weather data from 1976 to 2005 to make adjustments to zones all over the country. The zone map helps gardeners make appropriate choices when buying trees, shrubs, flowering plants, vegetables and herbs that will thrive in their particular area. Specific information helps gardeners take into consideration microclimates. Knowing which sections of your yard are warmer than others is also helpful. Sketch garden maps for flower beds, vegetable and herb patches, placement of new trees and shrubs. Decide the number and kind of plants needed to fill spaces. Buy bare root roses, order seeds and other plants for best selection. Sharpen blades and service lawn and garden equipment before the spring rush. Prepare pots and trays for seed sowing and transplanting. If you already have seeds, start growing cool-season vegetables such as broccoli, Brussels sprouts, cauliflower and cabbage, and flowers including impatiens, begonia and geranium. Our expert staff is always on hand to help you with gardening projects. From landscaping equipment to earth drills, if you have any questions about what to choose, pricing or how-tos, don’t hesitate to contact us. Stop by our store — we’re open seven days a week. For anyone working in construction, the versatile backhoe loader is one of the industry’s go-to machines, a popular choice that’s powerful enough to take on jobs where moving earth, loading and spreading materials, installing big equipment like septic tanks, and digging water, sewer and gas lines are what needs to get done. Operating a backhoe loader safely using best practices starts with the person in the driver’s seat. Survey the job site well in advance of the work whistle, mapping out the safest routes for the backhoe in the least amount of time. Take a look at the condition of the ground around the dig site and decide what course of action to take. If you’re the operator, the first thing you should do after you jump in and take your place is fasten the seat belt. A roll cage will only protect you in case of an overturn if you are buckled in. Make sure the parking brake is engaged, then get familiar with the controls. Make sure you can reach all of them easily while sitting in the seat and that they move freely. Below are a few more steps for operating a backhoe loader safely. Steady, even, level movement is the safest way to maintain control of a backhoe loader. Even though most of its weight is distributed towards the rear, some loads will change the center of gravity, affecting the machine’s stability. When in motion, keep the bucket low to the ground. Driving up sloped surfaces in reverse, i.e., with the backend first, can keep the front of the backhoe on the ground, especially if there’s no load in the bucket. 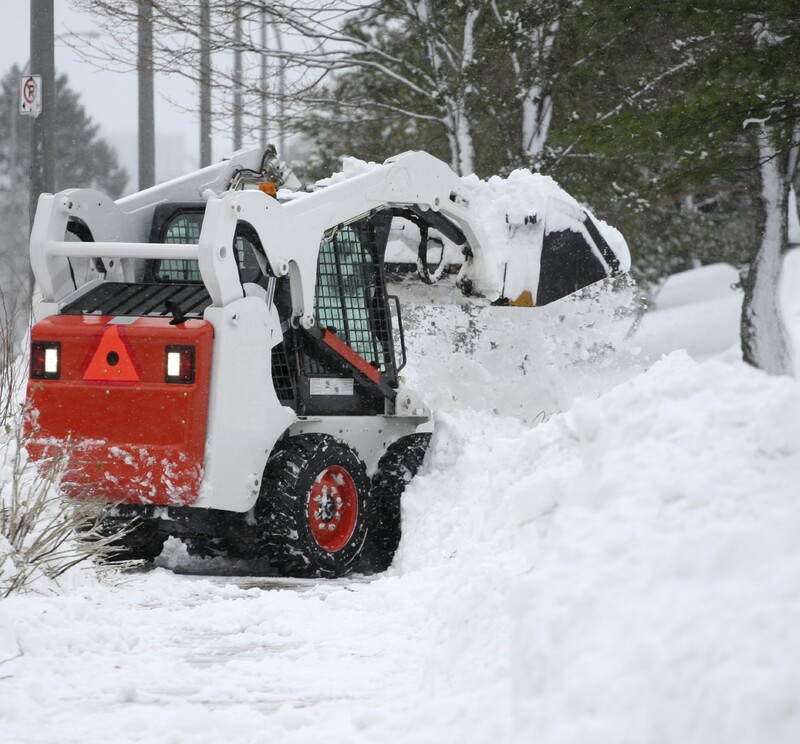 Operating a backhoe on slopes is the most difficult to maintain stability. Keep the backhoe as level as possible when in motion, taking care when repositioning on a slope. Backhoe loaders are equipped with stabilizer legs. Spread them out to their full width, which will hold the machine in place while digging or lifting the bucket. If at any time the machine starts to feel unstable, stop everything to regain control. Make sure to check the job site for any buried utilities such as telephone or natural gas lines and electrical transmission cables. Avoid cave-ins by knowing the soil conditions beforehand and placing excavated material at least three feet away from the dig site. The operator is responsible for the safety of all personnel around the dig site. Before moving the machine, sound the horn or the backup alarm to alert other workers. Before any heavy lifting, survey the area for people in the way and make sure the backhoe is as stable as possible. It is the operator’s responsibility to know how much a load needs to weigh to pick it up safely at a given angle. This requires a study of the machine’s lifting capabilities; the heights and distances are found on its spec sheet. If in doubt, test the lift before any material is moved. Slow and steady wins the race here; transport excavated material with the bucket low to the ground, rather than too high in the air. After work is finished for the day, park the backhoe on a level surface. Set the parking brake, lower the front and back attachments to the ground, put the engine in neutral gear and drop the hydraulic levers to release any pressure. Our expert staff is always on hand to help you with excavation projects. From backhoe loaders to bulldozers, if you have any questions about what to choose, pricing or how-tos, don’t hesitate to contact us. Stop by our store — we’re open seven days a week. Shot blasting is a process used to remove built-up coatings, contaminants or impurities from surfaces by forcibly propelling an abrasive material against it to achieve a clean result. Often used to prepare a floor for further processing, such as the application of industrial flooring systems and epoxy coatings, shot blasters use the blasting material, or media, to smooth and shape a surface, as well as, roughen a smooth surface, depending on the size, shape and density of the media, the coverage of the blast and the angle of impact. This type of abrasive blasting takes several forms, including bead blasting, soda blasting and sand blasting, and has seen effective use in industries like shipbuilding, automobile and metal manufacturing, foundry and welding, aviation and the production of tanks, silos, pipelines and chassis. A form of shot blasting is also used in the fashion industry, to roughen brand new denim for instance, giving it that well-worn patina. Shot blasters use centrifugal force powered by a rotating wheel at high speed to shoot media made from steel, copper, nickel, glass, iron ore, even dry ice, ground walnut shells, or water, at the work surface. 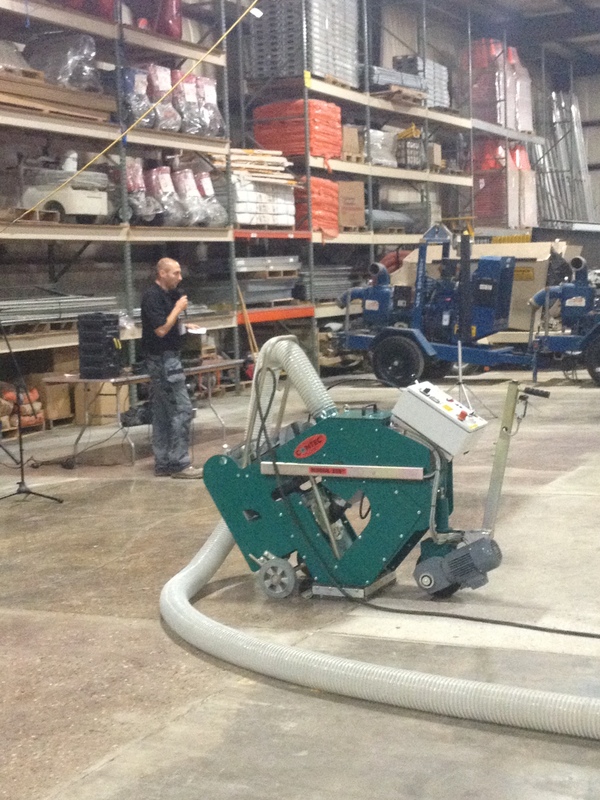 Whereas sand blasters use compressed air to shoot a high speed stream of abrasive sand at the work surface. Shot blasting does not generate dust like sand blasting, which has less impact on the environment, and can improve the fatigue strength of the surface. Sand blasting also improves the surface quality and mechanical performance. Shot blasting is an ideal process for cleaning off thin coatings and paint from large spaces because it is dust-free and usually dry, the blasters provide an accurate blast pattern and a wide assortment of abrasive media is available and re-usable, all at a relatively moderate cost. When using a shot blaster, protect yourself by wearing eye and ear protection, heavy boots, long pants and shirt. Turn the shot blaster on and adjust the pressure incrementally from the lowest setting, moving up to the highest speed as you test the area to be cleaned. Starting at the furthest corner of the work area, walk slowly with the machine in a linear motion across the surface, making several passes until the area is completely clean. Our expert staff is always on hand to help you with renting or buying sand blasters and shot blasters. If you have any questions about what to choose, pricing or how-tos, don’t hesitate to contact us. Stop by our store — we’re open seven days a week. For more information on shot blasting, read these two posts from our Runyon Service Prep blog: What Grinders, Scarifiers, Shot Blasters & Scabblers Can Do For You and Remove Residue Build-Up with 4 Proven Methods. Bringing a dull, scratched hardwood floor finish back to perfection used to mean sanding down to bare wood, but not always. A technique called screening takes off the worn top layer of coating, leaving the wood underneath ready for a new finish. It’s inexpensive, less risky and lets you do the work yourself without the hassle of hefty clean-up. polyurethane. Then, you can re-finish the wood as you desire. Step 1. Remove everything that collects dust from the room. Seal off doorways, duct registers and cabinet doors with plastic sheeting and masking tape. Open the windows if possible. Remove baseboard molding and put on a respirator. Step 2. Prepare the screening disk by sanding it with a palm sander and 100-grit sandpaper. Use four screening grits, from rough to smooth (60-, 80-, 100- and 120-grit). Step 3. Fit the floor polisher with the first screening pad and begin screening the floor, just like you would to sand it. Use the palm sander or sanding pad and sandpaper to get into corners and edges. Step 4. When the screening is complete, wipe down walls and vacuum dust up from all surfaces. Use a tack cloth to pick up any remaining dust on the floor. If the floor is waxed, stained or damaged, sand the floor down to the base wood using a drum sander and edger. The most popular and readily available floor finish is polyurethane, because it’s tough and resistant to constant foot traffic. Choose an oil-based or water-based polyurethane depending on the effect you want to achieve. Oil-based polyurethane dries slowly, is relatively smelly and turns a light amber color with age, while water-based dries quickly, emits no odor and remains clear. With both types of polyurethane, apply at least two coats along the grain of the wood. For the smoothest finish, use a pole sander to sand lightly between each coat using 100-grit sandpaper, leaving the last coat shiny, which will last for years. Polyurethane finished floors can also be waxed and buffed. To add a different color to a floor rather than the natural wood color, use a penetrating hardwood floor stain before finishing with polyurethane. Apply the stain along the grain of the wood with a rag or paint roller directly to the screened or sanded floor as evenly as possible. Allow the stain to dry before finishing with several coats of polyurethane – again, sanding lightly between coats. Penetrating oils and sealers like linseed oil, soak into the wood and the floor will require a wax for protection. Apply directly to the screened or sanded wood surface. Occasionally, wax is used as the only floor finish. Make spot repairs on wax floors by rubbing lightly with steel wool, then applying more wax and buffing. Our expert staff is always on hand to help you with your floor refinishing projects. If you have any questions about how to choose floor polisher or floor sander, pricing or how-tos, don’t hesitate to contact us. Check our recent blog post, How To Sand & Finish Your Wood Floor in 3 Simple Steps, for more helpful information. Stop by our store — we’re open seven days a week.